The Dark Side of a Mini Addict: Etsy purchase and my precious new addition to the mini household! Etsy purchase and my precious new addition to the mini household! The pictures don't do them any justice but please take a gander. As Christmas fast approaches I needed to start getting the mini house in holiday spirits. 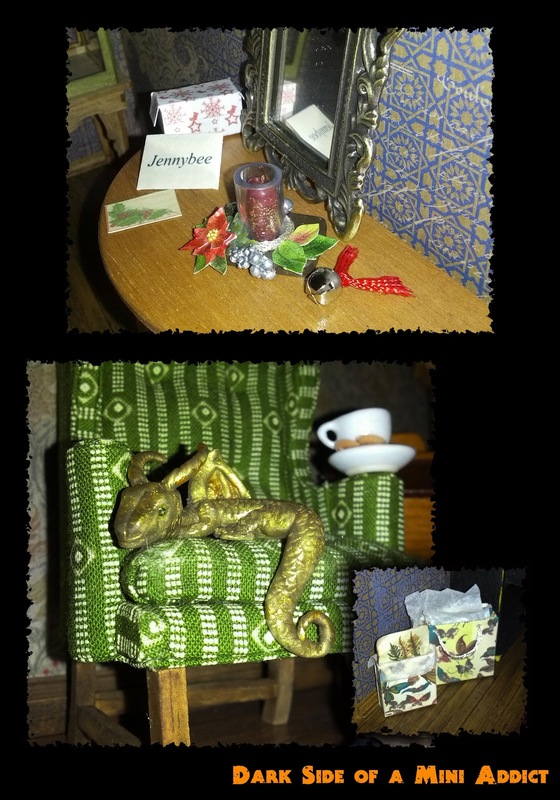 What a better way then to decorate the foyer with this lovely candle and poinsetta made by Jane from MiniFanaticus. Did I mention made...Well let me brag on she was also made: the bags with tissue paper, red and white Christmas box which had the silver bell inside, my very first christmas card in mini this year, not shown - - a book that you can open and flip through the printed pages and the little dragon laying all comfy on the chair. Now my table is starting to look a little festive and with the shopping bags it looks like the residents of the house just got back from a little shopping. YEAH!!! Thanks soo much Jane. Now I'm off to decorate a tree or two before Verda goes on strike.